ZHM Positive Displacement Flow Meter is are ideal for measuring the flow rates multi-viscosity fluids, as well as abrasive fluids and fluids under high pressure, such as paints, coatings, waxes, epoxies, sealants and oils. The ZHM Positive Displacement Spur Gear Flow Meter is ideal for measuring the flow rates of multi-viscosity fluids, abrasive fluids, and fluids under high pressure such as paints, coatings, waxes, epoxies, sealants, and oils. These flow meters feature strong and durable stainless steel gears and bodies with tungsten carbide bearings for the toughest operations. These finely engineered flow meters also prevent fluid slippage and allow flow measurement accuracy of +0.5% of reading even at the lowest flow rates and in changing viscosity conditions. 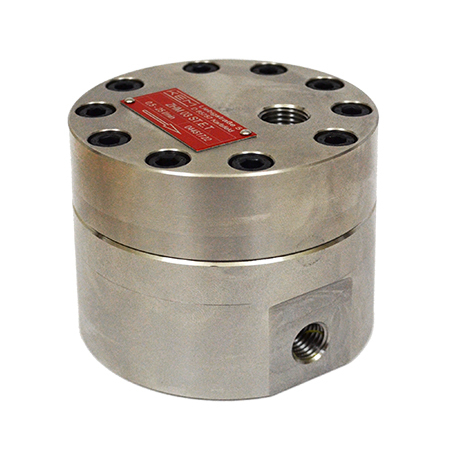 Talk about tough – these positive displacement flow meters from AW Gear Meters can handle it. They feature rugged stainless steel gears and bodies, and even tougher tungsten carbide bearings. So not only will they meter abrasive fluids and fluids under high pressure – they will do it for a very long time. While these in-line flow meters have super strong construction characteristics, they are also finely engineered, which prevents fluid slippage and allows the devices to measure even the lowest flow accurately. Simple to install & Use: These meters are easy to use and install, since there is no need for straight run piping upstream or downstream of the flow meter. Non-intrusive sensors, panel mount displays, and electronic modules available. Rugged Construction: The ZHM’s solid construction is offered in 303. Flexible Meter: may be used in applications requiring bidirectional flow, and is offered in ten different flow ranges (0.001 to 265.0 GPM). Economic Low Flow Meter: The meters produce good resolution and high accuracy at low flow rates all for an affordable price. Additional sensors options available ask your AW-Lake Representative for more information.